The compliance obligations under Ohio’s renewable portfolio standard has been shifting from electric distribution companies to competitive retail suppliers as consumers are exercising their choice of electric service providers, according to a Feb. 11 draft annual report by the Ohio Public Utilities Commission staff. Competitive suppliers were responsible for about 77 percent of Ohio’s overall compliance obligations in 2017, while distribution utilities accounted for the remainder. The non-solar compliance obligation of 3,912,562 megawatt-hours and solar obligation of 175,185 megawatt-hours were exceeded as a result of over-compliance from some retail suppliers. 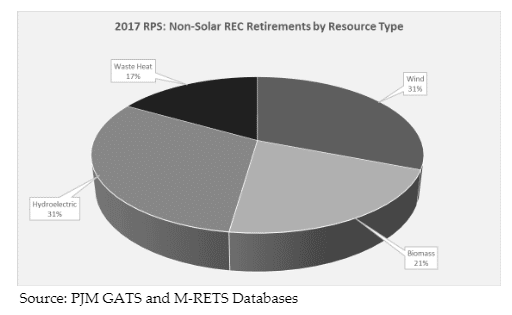 Some entities self-generated a portion of their needed compliance resources, but the main compliance strategy was purchasing RECs and S-RECs from independent power producers, aggregators or brokers. Biomass energy contributed significantly to the renewable energy certificate retirements; Ohio rule includes biomass energy produced from organic material derived from plants or animals and available on a renewable basis, including biologically derived methane gas, wood/wood waste solids, and sludge waste. Ohio has a target to procure 12.5 percent of electricity from renewables by 2026, with a solar carve-out of 0.5 percent; the 2017 annual benchmark was set at 3.35 percent from non-solar resources and 0.15 percent from solar.